On 28 June 1942, Army Group South began Operation Blau, the German Army's summer offensive into southern Russia. The goals of the operation were to secure both the oil fields at Baku, Azerbaijan, and the city of Stalingrad on the river Volga to protect the forces advancing into the Caucasus. 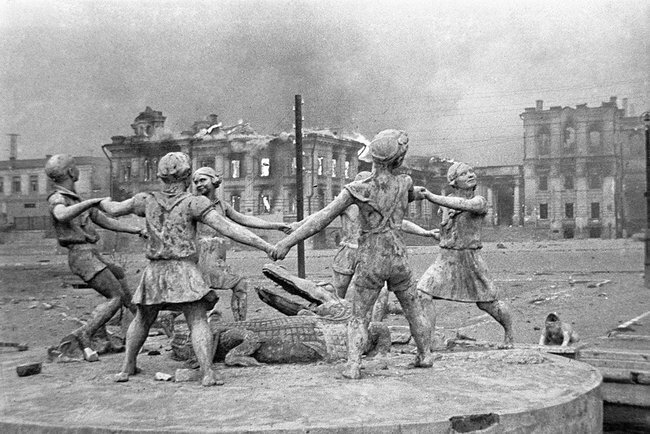 After two months, the 6th Army reached the outskirts of Stalingrad on 23 August. On the same day, over 1,000 aircraft of the Luftflotte 4 bombed the city, killing many civilians. Stalingrad was defended by the Soviet 62nd Army under the command of General Vasily Chuikov. Despite German air superiority over Stalingrad, and with more artillery pieces than the Red Army, progress was reduced to no more than several meters a day. Eventually, by mid November, the 62nd Army had been pushed to the banks of the Volga, but the 6th Army was unable to eliminate the remaining Soviet troops. On 19 November the Stavka launched Operation Uranus, a major offensive by Soviet forces on the flanks of the German army. The first pincer attacked far to the west of the Don, with the second thrust beginning a day later attacking far to the south of Stalingrad. The 6th Army's flanks were protected by Romanian and Hungarian troops, who were quickly routed, and on 23 November, the pincers met at Kalach-na-Donu, thereby encircling 6th Army. A relief attempt was launched on 12 December, codenamed Operation Winter Storm and failed. The army surrendered between 31 January and 2 February 1943. German casualties are 147,200 killed and wounded and over 91,000 captured, the latter including 24 generals and 2,500 officers of lesser rank. Only 5,000 would return to Germany after the war. World War II German Army. World War II Russian Army. Painting World War II (WWII) Germans. Painting World War II (WWII) Russians. Stalingrad Battle Reports & Scenarios.